Candles make up the perfect decorative pieces and add a warm glow and lighten up even the darkest corners. Pillar candles are available in various designs, patterns and colors. Candles are household products easily found in all homes but these pillar candles serves the purpose of decoration as well along with providing brightness. 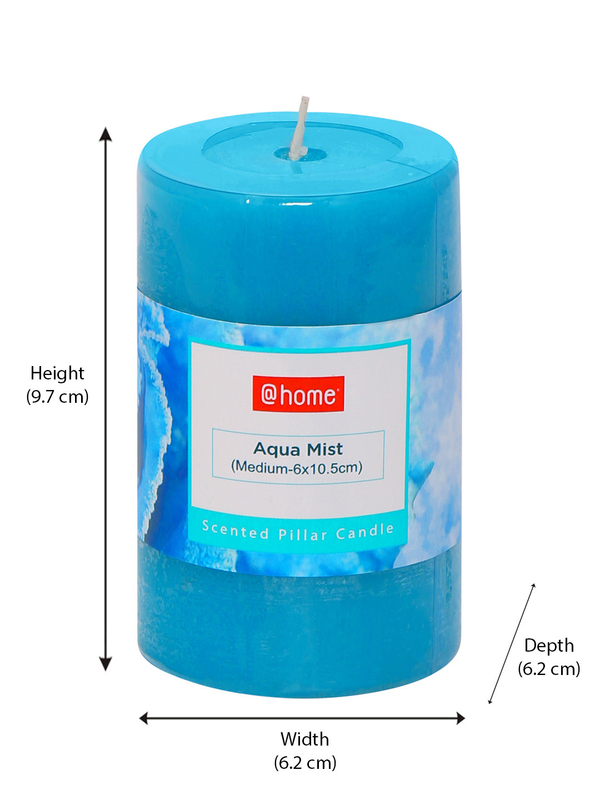 This pillar candle is a beautifully crafted aqua mist colored piece. The candle falls under the medium size variant being 6cm x10.5cm in dimensions with height of about 9.7cm, width 6.2cm and depth 6.2cm. The pillar candles contain a sweet smell which can lighten up everyone's mood and freshen up their mind and soul. The cool sea green colored pillar candle fits in perfectly with all color schemes and are perfect matches for aqua shades of blue, turquoise, mist and sea green. It very well complements the decorations organized in the cool shades of the color wheel. The pillar candles add a renowned elegant look to any occasion or event. Pillar Candles can be used for decorating table top surfaces in homes such as in bedroom, living area, center table as well as in offices, shops or boutiques. Pillar candles form a majestic and elegant look and appeal to the spaces where they are placed in. Avail these pretty aqua mist rustic medium sized pillar candles from @Home now.